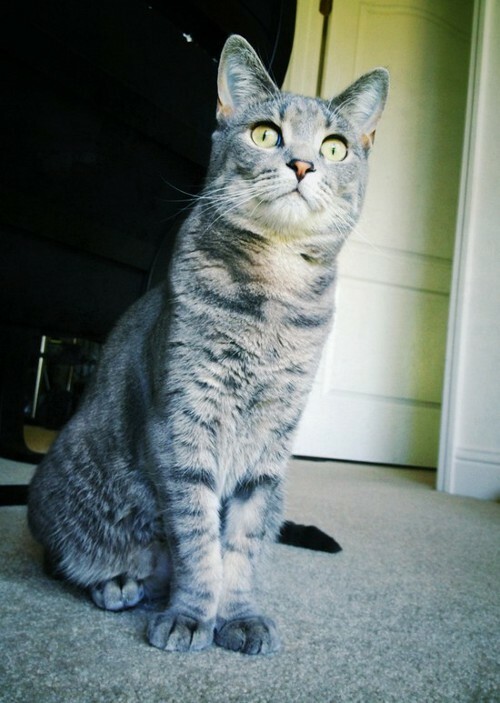 Say hello to the featured cats for April, 2013. These cats own some of our visitors. 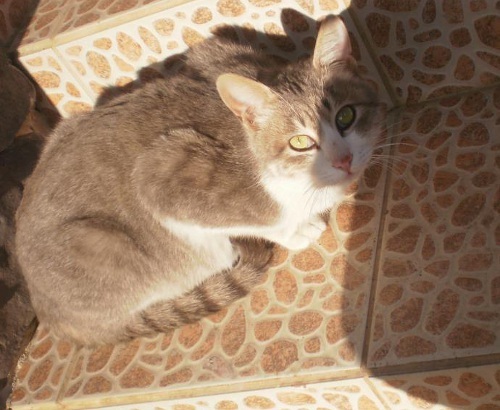 We've got another collection of fantastic felines, don't you think? This month, we've got quite the line up, including a "naked" cat, a tiny panther, a tiny frozen kitten with a near-death experience, a cat that sits on chicken eggs, and we've thrown in the kitchen sink for good measure. 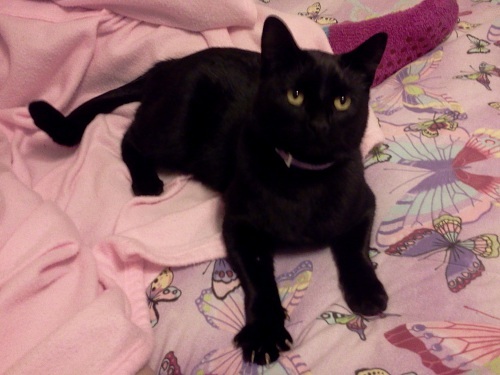 Kathy Bennett shows us her "American Panther" AKA BubbaCat! This month, we've got everything and the kitchen sink. 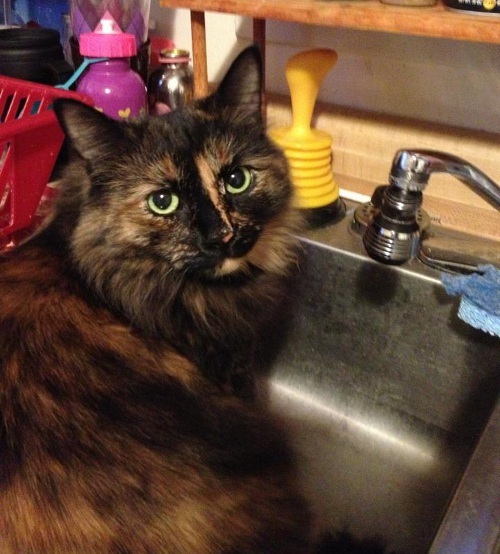 Amy Marie sent me this "Cats in Sinks" picture of her tortoiseshell longhair, Mollie Mae. Samantha Stickney says that "naked" kitties are the coolest cats. "They just wanna be with you and hang out." Although I've never met one in person, I've heard that about the Sphynx. 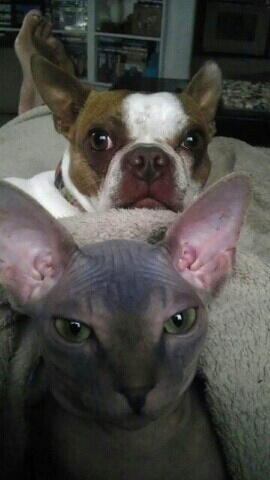 Here's Neytiri with her dog buddy, Amy. Racheal Amy-Jane says "I wanted to share my baby girls with everyone..."
"I love these beautiful kitties more then words can say." 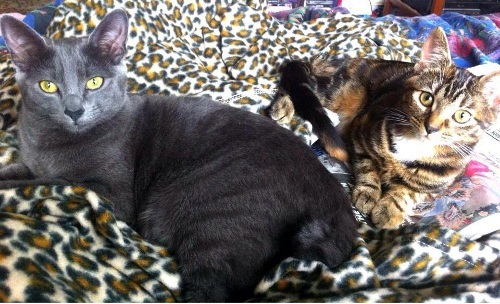 Pixie is the grey one on the left, and Angel is the one on the right. "Cedar! 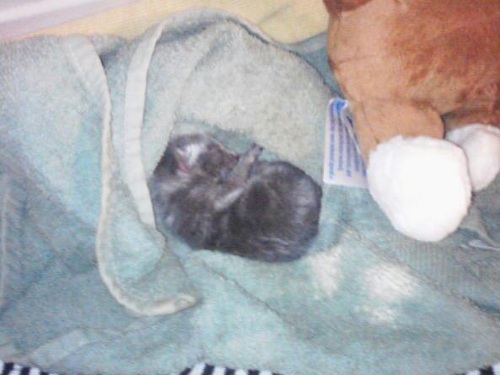 10 minutes old he was frozen and not breathing!" Jessica says "He is my whole world!!" She had many scares with him. He was premature, constipated, aspirated (and more). 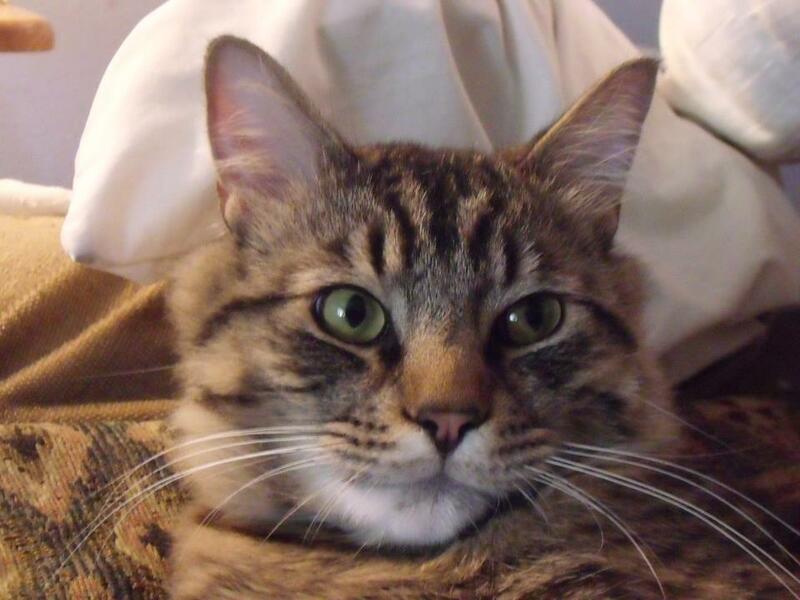 His momma cat was trapped and tested positive for FIV and FeLV! "I was a nervous wreck! Cedar tested negative! Yay! He is my BABY there is so much more to say and show! Thank you God!!" 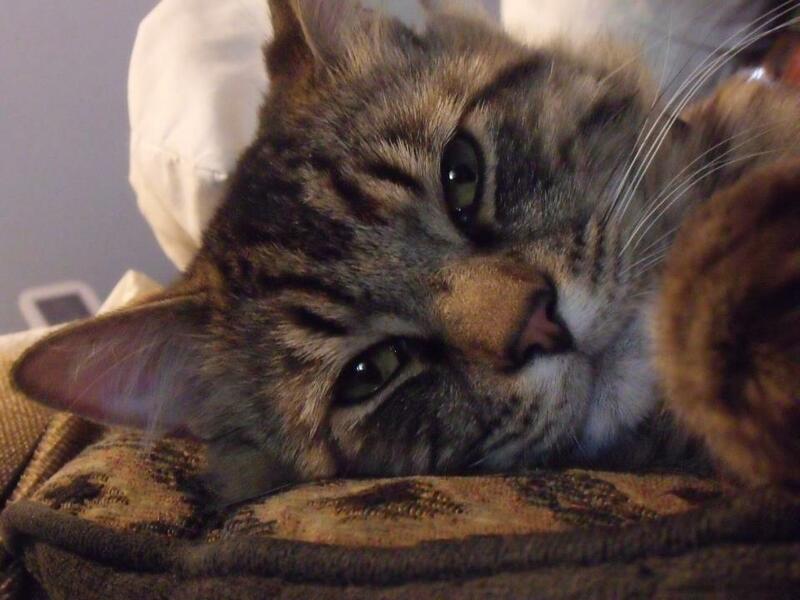 Chloe's human, Cindy Giannoulatos (@CindyIndyBones on Twitter) is an Egyptologist (how cool is that?!) and forensic anthropologist (almost as cool!). Sort of like a real-life Bones and Indiana Jones all mixed together. Now I ask you... who better to be a cat lover than someone who is an expert on ancient Egypt? Cindy says that Chloe's favorite thing to play with is a simple blue ribbon, and playing is a great way for her to stay in shape, since Chloe loves to eat - hey, who doesn't? Sharon Jun says that her cat is a farm cat who gets along with her dog but can't stand up to chickens. Sometimes, though, she'll sit on a recently laid egg. Maybe she's testing the limits of her relationship with the chicken? Steven Wilson says that his "little boy" turned 1 year old on April 4, 2013! Happy birthday Sampson! 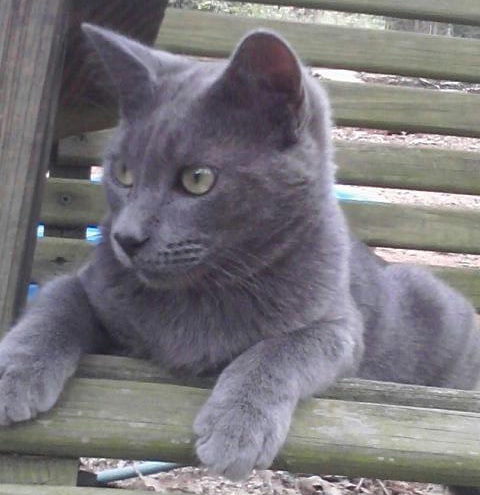 Feisty, yet lovable, he's a rescue that was born to a feral mother. They had her spayed and adopted out his 2 sisters, but were compelled to keep him. Steven said that his vet said he will be well over 20 lbs. when he finishes growing in about 3 years. 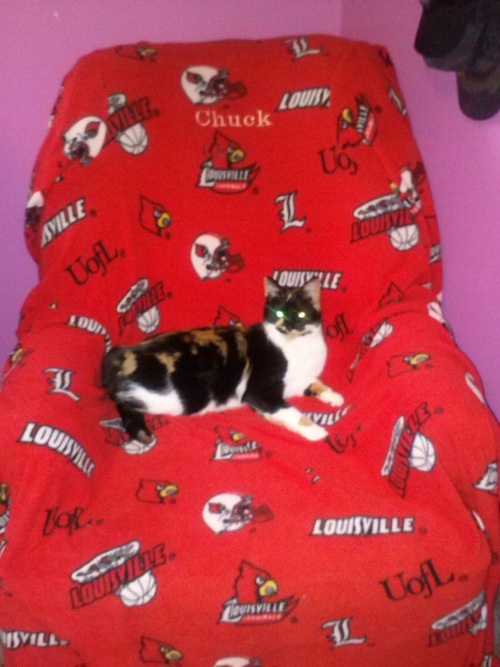 Tina Smith says that "Little Bit" is a true U of L Cardinals fan. "Go cards & bring the title home where it belongs!!!"